First, thank you, thank you, thank you for all of the kind comments on the last post. I tried to answer as many as I could, but if I didn't answer yours, please know that it was sincerely appreciated. I'm honored that so many of you shared your own personal stories and sent such heartfelt thoughts my way. You guys are the best! I really mean that! So, May. May has been busy. Catching up on things that didn't get done in early April and then tackling a couple of big projects I created for myself. The first of the big projects is one I started back in March that got put on hold for much of April. When we lived out in the "country" for a year, my daughter took sewing classes from a woman who worked in the office at her school. Mrs. H had a tiny room upstairs in her home where she had four sewing machines and taught a sewing curriculum just for kids. I loved the idea, so I decided to start my own sewing school. I purchased a license to teach the Kids Can Sew program in my area. 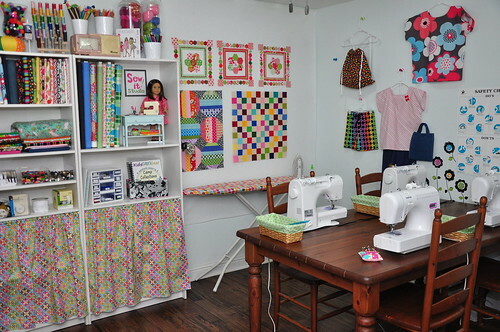 I converted my sewing room into a sewing studio. I started making up samples back in March along with getting "business stuff" taken care of. Earlier this month, I purchased four new computerized Brother sewing machines. I'm still putting the finishing touches on the studio and we had a little dry-run with a group of girls who were over for a slumber party. This isn't my ideal set-up, but I wanted to make sure that things go well before I invest in nice sewing furniture for four. It's been fun purchasing fabric and getting supplies ready. I had planned a summer full of day camps, but I didn't get any promoting at all done in April; I'm really behind and have only a couple of sign-ups thus far. The curriculum is actually written for a once-weekly one hour classes to be held year-round, so even if I don't have a full summer, I can hopefully start filling spots for the after school classes in the fall. I haven't done much quilting lately, but I've been sewing like crazy. That's my new sewing corner above. I had to fit myself into a much smaller area of the room to accommodate the "classroom" furniture and I moved all of my fabric into the closet. Luckily, this room has been the sewing room since we built the house last year, so the closet is all shelves and the fabric fit nicely. 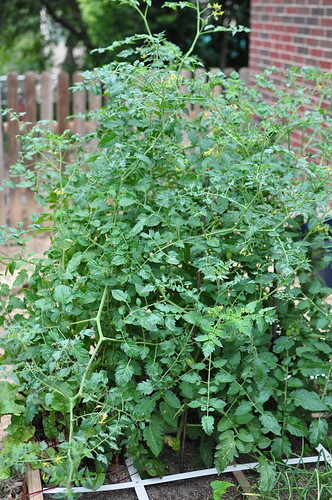 The veggie garden I started back in March is growing like mad. 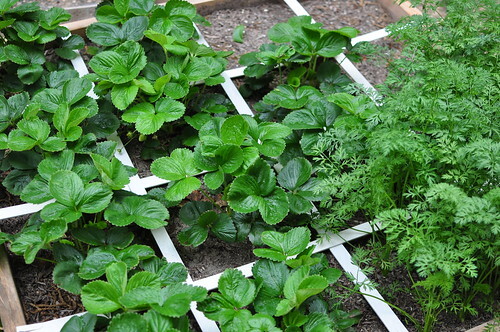 I started with two varieties of tomatoes, beets, Texas 1015 onions (which are so sweet you want to eat them like an apple), carrots, strawberries, zucchini, spinach, and romaine lettuce. The spinach and romaine are finished - it's already too hot for them here, but most everything else is flourishing! I'm having some trouble with blossom end rot on my zucchini and no one in my house except me eats anything I'm growing (with the exception of the strawberries and carrots). Now that the weather is warmer, I've planted sweet potatoes, okra, black eyed peas, bush beans, and some pickling cucumbers. 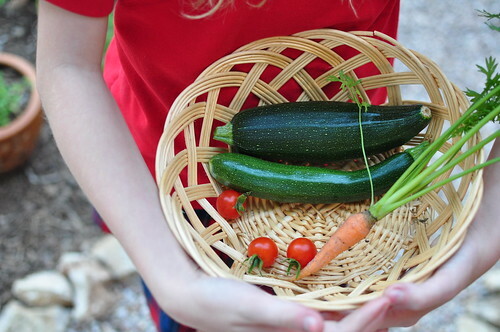 We get tiny little harvests throughout the week, but I'm just giddy at the fact that I grew that stuff from seeds! The carrots aren't ready, but Shea was itching to pull one, so she had a baby carrot and said it was delicious. Just in case the veggie garden and the new sewing school wasn't keeping me busy enough, I decided to forgo the front lawn and put in a cottage garden. (I don't know what's wrong me with sometimes.) When we re-built the house last year, the existing lawn was completely trashed. The city put down some sod between the street and the sidewalk when they repaved the street, but it wasn't really the right time of year to lay sod, so we just over seeded the remainder of the yard with annual ryegrass. When it warmed up and was safe to lay sod, I decided I didn't want any and started digging instead. My yard has been in serious transition for almost a month now. I'm doing 95% of the work all by myself. When I overload the wheelbarrow and can't move it, I have to call in the hubby for some muscle and he pitches in that other 5%. 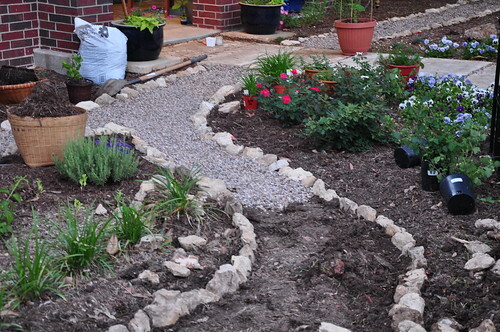 Kind of a funny story, but those larger rocks lining the pathway were my nemesis earlier in the spring. Every time I stuck my shovel in the ground, I hit one. I'm not kidding, every time. I had to plant pansies with a pickaxe! I was cursing those stupid rocks like crazy and wondering how on earth I'd ever get rid of them all. I even wrote a scathing poem about how much I hated these rocks. 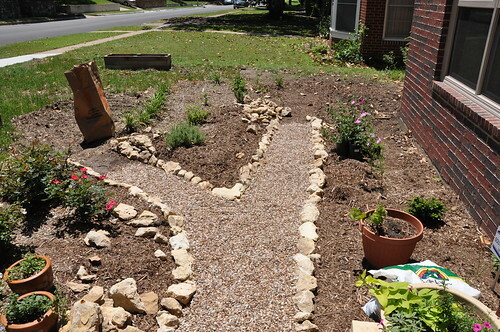 But when I decided to put in pathways and plant a cottage garden... well talk about making lemonade out of lemons! Now when I hit one of those limestone beasts, I can't wait to unearth it and see if it's big enough to use for my garden. The photo above was taken in the morning on May 13th. Here it is that afternoon. In my part of north Texas, we have this dreadful black, heavy clay soil. When dry it's like digging in concrete and when wet it's like digging in, well, packed clay. I've been removing a few inches of soil and amending the clay with a variety of organic matter (a mixture of different composts mostly) as I go. I've decided that my favorite part of getting older is the fact that I begin to care less and less what other people think about me. Ten years ago, I wouldn't have dreamt of putting a fence around my front yard and planting the entire thing with flowers, herbs, and vegetables, even though a lush garden has always been a dream of mine. I would have worried too much about what the neighbors thought. That said, I'm still mindful of how the yard looks from the street and I'm not going for that Sanford & Son look, but I'm just glad that I feel okay with doing something I consider a bit out of the norm. This is my fourth attempt at this post. I posted it earlier today with more photos and it wouldn't display correctly. I tried all kinds of things (I hope it hasn't showed up three or four times in your reader), but I couldn't find a solution and I won't know if this worked until I post it. Take care everyone and thanks again for the thoughts, prayers and kid comments. Melanie, great idea with your sewing school, all the best for that!! and i love your garden! it looks looks awesome and is such a great activity, isn´t it? the only thing i don´t like about gardening is that it is stealing time from sewing but then a girl has to get out of her sewing room once in a while..
Melanie - I'm so excited about your sewing school! It makes me wish I was a kid so I could be in your class!!! Those machines are awesome for the kids to learn on. You will have no problem filling these classes as soon as word gets out about it. I love what you said about getting older and not caring as much about what people think. I totally agree with that. I've been the same way since I turned probably 45 or so. Fighting this breast cancer has made me care even less about what others think. It's my life, not theirs, and I want to try to make ME happy now. Life is too short to worry about everybody elses opinions of me! Glad that you seem to feel some better!!! The studio looks great! I hope it all comes together for you with teaching. And glad to hear that you are finding purpose going forward. Hang in there. What exciting news! You will fill your classroom before you know it. I feel like I need to commiserate with you on the N.TX clay soil...we rented a tiller for our tractor and it just bounced over the top the ground was so hard....so we watered it a bit, let it dry out overnight, and tried again, we scratched the surface, but determined that nothing was going to grow. We then ordered a dump truck load of sand and compost and are now methodically moving it a wheelbarrow load at a time. Keep at it and congratulations on your new sewing venture. 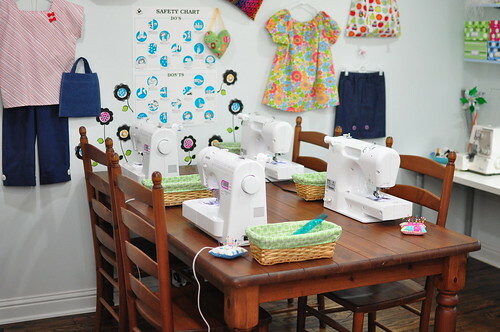 This is a wonderful idea to have a sewing class for kids. Tell me more about this license that you purchased. Also, are these Brother International brand machines or the Brother brand sold at discount stores? Hello there. I love the Kids Can Sew program! We sure need more classes of creativity and classic hand crafts to inspire the young ones to make their own things. To teach them the joy of making something for themselves and others. Handmade. Unique. Personal and special. My daughter loves it when I take the time to teach her crochet or sewing. Her favorite time in school is during sewing class. In Sweden where I am from, we had sewing or wood crafts every year during 4th-6th grade. Sewing class 1 term, wood crafts the other. I can still remember making a patchwork wall decoration with pockets that I had for years on my door and filled with my private stuff. How I knitted mittens and socks, crocheted pot holders and gave away for Christmas. An embroidered pillow is still decorating my Mum's kitchen bench and a morning robe made from the softest flannel with cute kittens on was my favorite morning outfit for years. I am inspired to maybe do something similar in my teeny tiny village one day. Great idea! Thanks for sharing. And I am envious to see you are already harvesting. We only have strawberries so far... and I totally agree about the ageing thingy. It is nice to get older and wiser. It took me 42 years to understand that I am who I am and I don't have too please anyone. I can just be me. That is a huge realization. Your post made my day. Have a lovely time creating your lush, crazy, wild beautiful garden. 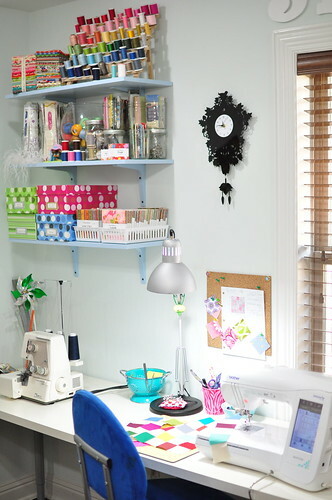 Your sewing room looks so inviting (and so tidy!). I think your sewing school idea is great, I am sure it will be a success. I am about to start my own Craft Workshops project in the backroom of our retail store in Edinburgh. More for adults, but I may do some kids classes (well get somebody else to do them anyway!). Got to survive this recession any way we can! Glad you are feeling more positive too. 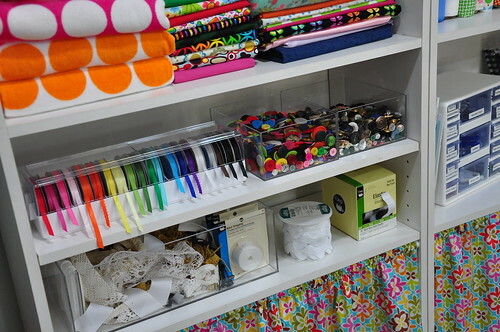 Love the sewing studio! I also have considered teaching sewing. I really want this next generation to enjoy the process of making things by hand, and I think instruction and inspiration is less and less available to them unless they have 4H or something. I am your newest follower. I really enjoy all the pictures, the studio and the garden stuff. Looks just like home! We must have lots in common. Maybe we will get to know each other someday! Please come visit my new blog, Ric Rac and Polka Dots. It is brand new, but I have lots of fun stuff planned to share. I hope to see you there! Love it Melanie! 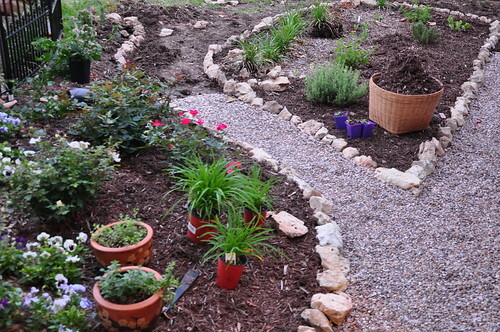 Can't wait to see how that front yard garden progresses...that is something I would love to do! i also see we have the same brother sewing machine! I love mine so much as it does everything for me - and the sad face when I've run out of bobbin thread gets me everytime!